To achieve a greater degree of integration into society, those with vision loss need the confidence to advocate on behalf of themselves and, by extension, on behalf of all those who live with a visual disability. Confidence is what enables us to act as ambassadors for the vision-loss community to the broader sighted community. By reaching out and educating the general public about living with a disability, we can work together to identify and remove barriers, and make our society more inclusive. Our major outreach initiative is the White Cane Week Experience Expo, a public-awareness event and exposition of the supports and services available to those living with vision loss in Toronto. Through our many activities and outings, we engage the people, businesses and institutions in Toronto in a conversation about integrating those with vision-loss into the daily fabric of society. 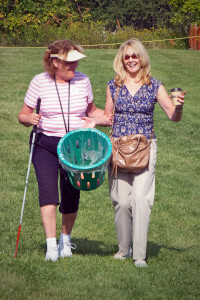 We have partnered with other blindness-related organizations on a variety of advocacy issues. With the CNIB, we&apos;ve worked to advocate for more inclusive, accessible Federal and Provincial elections and to update the Adaptive Devices Program (ADP) funding for new adaptive technologies. With the Alliance for Equality of Blind Canadians (AEBC), we&apos;ve co-sponsored workshops for people with disabilities to self-advocate for equitable access to employment and have supported the "Sidewalks for All" campaign. We promote greater understanding through a school outreach program, in which member-volunteers speak to students in schools right across the GTA about what it means to live with a disability. Please contact us for more information on how the CCB Toronto Visionaries can help your students or community group learn about living with a disability.